My story doesn’t begin with me. I come from a family of addicts. I lost my grandmother and uncle to suicide. My birth father was an addict and left when I was two. Fortunately, my mother was able to break the cycle and lived a sober life. She provided much love and guidance, yet the tentacles of depression and addiction permeated our lives in ways I only recently discovered. I was born and raised in Utah, though I’m not Mormon and I don’t ski. I moved out of my home at 17 but was able to finish high school while managing a coffee shop. I was then able to go to college and study child psychology. After 2 years of college, I became pregnant with my oldest, got married and moved to California, where I had 2 more children. As a life-long learner, I became obsessed with parenting and education, which led to homeschooling my three children. To contribute as a breadwinner, I also learned how to flip houses which enabled me to stay home with my children. The only thing that slowed me down was dealing with bouts of a connective tissue auto-immune disease which resulted in chronic pain. That is the easier part of my story to tell. Now comes the tough part, the part that brings me shame. It makes me feel somehow lesser than everyone else. I am educated, driven, loving and yet I am a woman in recovery from my dependency on pain medications, which led to my becoming homeless. I am willing to tell my story because homelessness can happen to any one of us. My downward spiral went like this: First, I got divorced. I went to court twice for custody of my children and was granted it both times. But, as my connective tissue disease worsened, so did my need for increasing doses of narcotic pain medications, to the point that I couldn’t maintain work, nor parent my children on a full-time basis. I came to the realization that if I was going to have a chance of being the parent I used to be, I needed treatment. I spent one year in treatment in California, learning how to cope with my pain without medication. 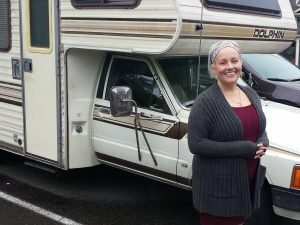 After moving into a sober living house, I got a job and earned enough money to buy a 1984 RV, as well as to drive it to Seattle. It has since become my full-time residence. Before I could fully reunite with my children, I knew I needed help and resources. I already knew about Elizabeth Gregory Home, as I had been a volunteer for a brief time several years ago. Although I still can’t believe I’m on this side of the equation, I knew a warm welcome would greet me at EGH and it would be a soft place to land. I described my downward spiral, now I’ll address my uphill climb! Elizabeth Gregory Home has been a huge support in helping me navigate the challenges of living in an RV. Each night, I never know where I’ll end up. Twice this week I was awoken by police knocking on my door, despite the fact that I was in a “safe” designated spot where I was supposed to be allowed to stay for 72 hours. I was pulled over because I had a tail light that was out. Additional repair needs included both the door to my propane tank and the sewage hose falling off, which meant I couldn’t empty my sewage. And speaking of sewage, I can only afford gas to go to Fife once each month to empty it. I am in constant search of a public restroom. I am unable to shower. But, even if I never know where I might end up each night, each day I know that Elizabeth Gregory Home will be there for me. It has both saved my life and given me hope. I can take a shower. I can access nutritious food. I can rest in a warm place when my chronic pain is flaring. I can use computers to apply for jobs. I can use a phone in a private room to make critical phone calls. Thanks to these resources, I have been able to get back on my feet. My self-confidence is slowly building. Three weeks ago, I applied for two jobs, and after interviewing, was offered both! I’ve begun working over 20 hours each week, which still allows a bit of time for my body to heal, although commuting in an RV has its challenges! I now have regular contact with both daughters who are over 18 and was just officially granted visitation with my twelve-year-old son. Once I am able to pay off some of my debt, I hope to save enough money to move into an apartment next year, which would allow me to apply for shared custody. My other dream is also coming true: I’ve received a scholarship to start a 6-month certificate coaching program. My life is moving forward, and I know in my heart that I couldn’t have come this far without the support of Elizabeth Gregory Home. Two things help me face each day: knowing that Elizabeth Gregory Home has my back, and reflecting on how amazing it is to reunite with my children. 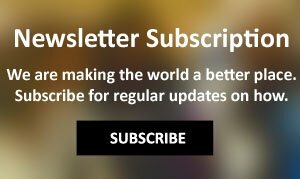 Update: “Thanks to the support of Elizabeth Gregory Home, I now live in an apartment and have part-time custody of my 14-year-old son and recently completed a coaching certificate program.” said Emily. She continues to give back to EGH by volunteering in the Day Center each week.